How Can You Decorate a Seashell Mirror? If you like to do fun, inexpensive, do-it-yourself projects that can also become a stunning centerpiece of any room, you'll really like making a seashell mirror. Having a frame-less mirror is the first key to this project. If you don't already have one (such as an existing bathroom mirror), you can always pick one up at thrift store or home store. Other items you're going to need to make your seashell mirror include a hot glue gun, a small package of hot glue sticks, and seashells. You can get the seashells in craft stores or discount stores. Make sure that the shells you pick include a mixture of different sizes and types of shells. For a different look, painting some of the shells may also be an option. If that's something you'll want to do, go ahead and pick up some acrylic paint in the colors you want while you're shopping. Important Note: Be sure to use a hot glue gun and clear hot glue gun sticks. Do not use any other adhesive for your seashell mirror. Other adhesives, even those made for bathroom or kitchens that may seem superior, will not hold the seashells and they will fall off. These other adhesives also will show up on your mirror, whereas the clear hot glue will not. To get started on your mirror, empty all of your shells out and sort them by size and shape or type. It doesn't have to be a perfect sorting -- just get them ready so that you can more easily grab them as you work. Sorting them by shape and size helps a lot because you'll be finding gaps in your seashell border that will need just the right shell. Keep any broken pieces as well, as they can come in handy in an area that won't quite fit an entire seashell. If you're going to paint your seashells, it's best to paint them before you glue them to the mirror. If they're going to be all the same color, just give them a quick bath in the paint by putting them all in a plastic bucket and coating them in the paint. Lay out a garbage bag and after dripping any excess paint off of them, lay them out on the bag to dry. Even a diluted paint will stick to the shells, so very little paint will go a long way. Spray paint will also work. Before you start sticking some seashells onto your mirror you need to do a tiny bit of planning, and by tiny, I do mean very little because most of this project is about being completely random. The small part that needs planning is just how big of a border or frame you want to make out of the shells -- it's important to keep that same width throughout all sides. To figure this out, you can simply envision in your mind an approximate border width that you'd like to keep and just guesstimate as you go. But, if you worry you'll be too wide in some areas and too thin in others, you could use an Expo marker to draw a general outline that you should stay within (and then wipe it off). Keep in mind, though, that being imperfect is part of the charm of this project, so try to not worry about it too much. Glue Gun Hot and Ready? Let's Go! Ready to glue? Apply a good size dollop of hot glue to the center of the outside back of the seashell or a good thick band around the border of the inside of it (depending on which side you want showing) and then firmly press it onto the mirror. The glue dries fairly quickly, so make sure to get it onto the mirror right away. You can start with any side of the mirror you want. I usually begin with a shell in each corner and then in the middle of each side and work out from there, but you can do it in any way you like. You can place your shell as close to the edge or as far from the edge as you want -- just stick it on and get your next shell ready because the glue dries rather fast. Continue around the edges of the mirror by gluing the seashells on randomly: some upside down, right side up, inside out -- you get the idea. If it helps, visualize the seashells laying on the ocean floor scattered about and recreate the pattern that you see in your mind's eye. Fill in any gaps with smaller shells or shell fragments as you go. Turning any plain mirror into a beautiful centerpiece is super simple, even for those that don't have a crafty side. 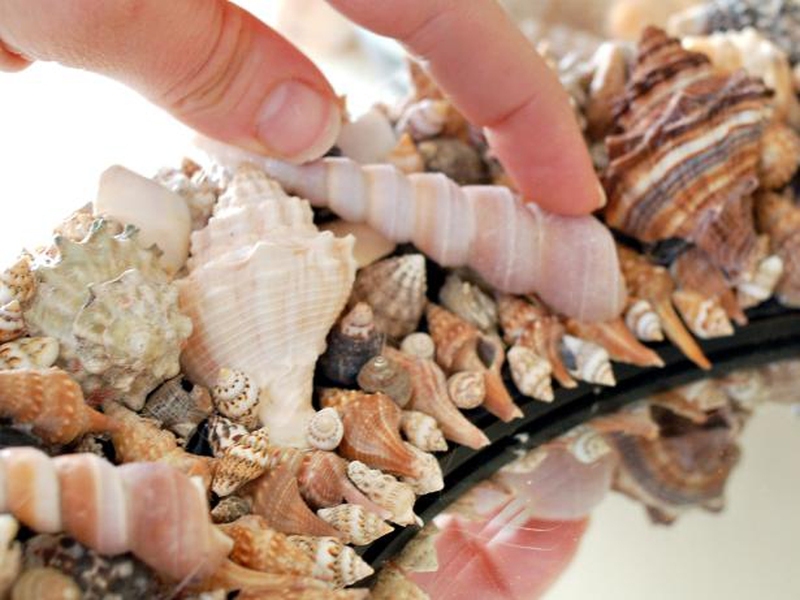 Just grab a hot glue gun, a few seashells and start gluing them around a mirror. You'll be surprised at just how good at crafting and DIY you can actually be!